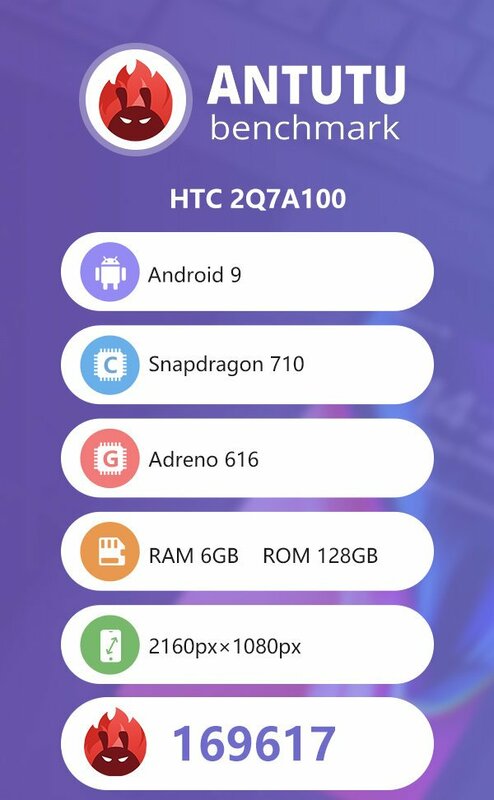 HTC 2Q7A100 AnTuTu Listing Confirms Key Specs - Playfuldroid! ?The mysterious HTC 2Q7A100 was spotted earlier today on Geekbench benchmarking platform. The same phone has now appeared on AnTuTu benchmarks with key specs. It appears that the arrival of the smartphone could be close at hand. The AnTuTu listing of the mysterious phone carries support for full HD+ resolution of 2160 x 1080 pixels. The Snapdragon 710 processor is present under the hood of the device with 6 GB of RAM. The native storage of the device is 128 GB and it is loaded with Android 9 Pie OS. It has recorded an average benchmarking score of 169,617 on AnTuTu. There is no information available on the other specs of the mysterious phone which happens to be the first smartphone for the year 2019. Only further reports can reveal whether it will be arriving as a U series or Desire lineup smartphone. The appearance of the HTC AQ7A100 at Geekbench and AnTuTu benchmarking platforms indicate that the smartphone may go official within the current quarter.